"The highlight for Laurel and me is to have visited Salamis and Paphos, which completes our list of New Testament cities associated with the life and mission of Paul from Jerusalem to Rome. I would strongly recommend the Cyprus Tours as an optional extension to an Early Christianity Tour of Turkey and/or Greece. The Cyprus based guides were both excellent and keen to please. They were not all that well informed about the biblical background, but were both very keen to learn. I would recommend that the tour would focus on Salamis and Paphos (the cities mentioned in Acts 13), visiting Salamis first (in the biblical order) on the first full day and Phaphos on the 2nd or 3rd day. The visit to the Castle is certainly an interesting excursion and should be included, but visited the 2nd or 3rd day rather than at the beginning. Students of the Bible would be most interested in the two cities connected with Paul and Barnabas rather than some of the other sites." Arrive Ercan Airport. Meet and transfer to hotel for dinner and overnight. After breakfast departure from the hotel by bus. Aprx. 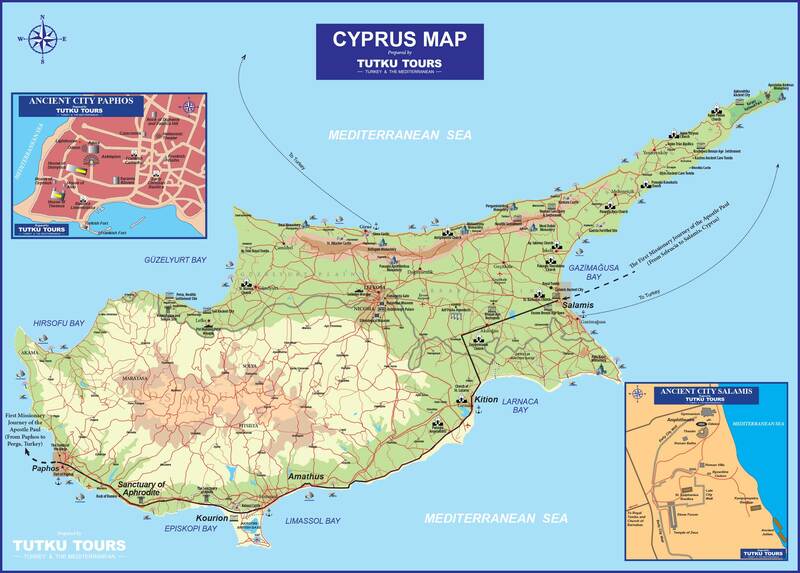 30 minutes drive to Nicosia which is the last divided capital city in the world after Berlin. Our excursion will cover only the Northern (Turkish) part of the city. Sights to see; Old city walls and bastions, historical North Gate (Also known as; Kyrenia Gate) Old city quarter, Selimiye Mosque (formerly St.Sophia Cathedral), The Grand Inn (Buyuk Han) and “Green Line” border zone with Ledra Palace building (U.N. headquarters at the buffer zone). Return drive to the hotel in the afternoon. Early departure from the hotel. Aprx. 1 hour drive to Famagusta. 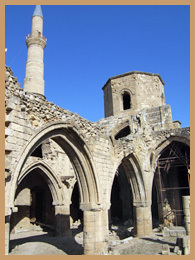 After a quick visit of the old city of Famagusta (housing ruins of many medieval churches and fortifications) the excursion will continue with another 10 minutes drive to the ancient city of Salamis (where Paul and Barnabas landed ([Acts 13:5]). Some of the Roman bath houses, the gymnasium, some early Christian basilicas, cisterns, mills and houses will be in the program. On the way back to the hotel the bus will stop by the monastery of St. Barnabas. The monastery is an icon museum today. Morning departure transfer to airport.